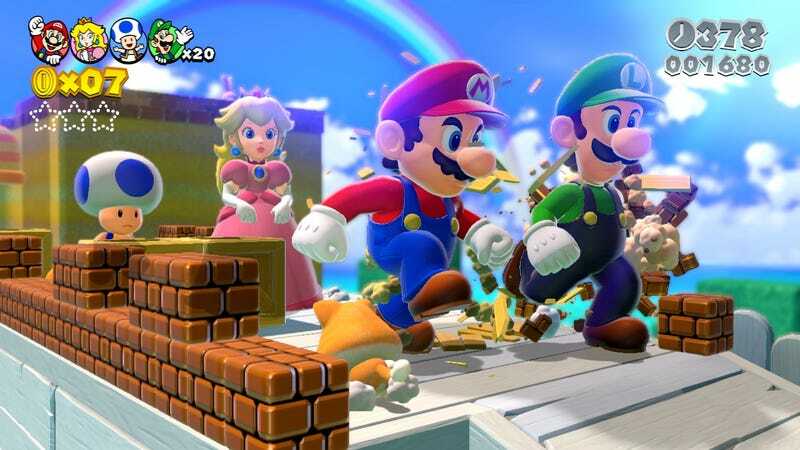 The upcoming Wii U platformer Super Mario 3D World, like many other Nintendo games, won't have online multiplayer. If you want to play with other people, you'll have to do it in the same room. Well, I guess one person could grab the Wii U GamePad and move to another room, but you see what I'm saying. This is an interesting decision, and it's something that the folks at Nintendo have discussed before. Earlier this year, Nintendo top man Shigeru Miyamoto cited latency as one of the reasons they hadn't added online multiplayer to Pikmin 3. They were much more interested in making multiplayer that people could play on a couch together, Miyamoto said. So during a video interview at Nintendo's NYC-based HQ earlier this week, I asked Miyamoto if he had changed his mind at all for Super Mario 3D World, which comes out on November 22. Would he ever consider adding online multiplayer to a Mario game? The people who make Super Mario 3D World want you to know that it&apos;s pretty great. "While online play is certainly technically possible for us, it simply wasn’t the focus for us this time around," Miyamoto said. "What we really wanted to do was to create something that people could experience fully while playing comfortably with others who were nearby them, and this is something we decided would be best for Pikmin and the best case for Mario here as well. "Now that is to say the answer to this question might change in ten years time, if there’s a future game where for example we don’t think it’s important to be able to see the face of the person you’re playing with, then we might be able to focus more on some online function there. But for right now our focus is really on a comfortable play experience with people in the same room." Granted, Nintendo has made games with online multiplayer before: both Mario Kart 7 and Super Smash Bros. Brawl let you play online with other people. But it seems like co-op Mario platforming will stay in your living room for the foreseeable future.